Room rates vary by date and may be higher during peak periods. Rates are based on single or double occupancy. For families with children, the hotel also offers Triple Rooms from SGD152 (USD124) per night. Cancellations must be made at least 3 days before arrival to avoid penalty charges. The V Hotel Lavender offers 888 affordably-priced guestrooms in central Singapore. Each room is fitted with one or two beds, a 32” LCD TV, mini-fridge, coffee/tea making facilities, and an ensuite bathroom. Hotel facilities include a swimming pool, fitness center, and restaurant. Visit http://www.vhotel.sg/ for more information or to make an online booking. 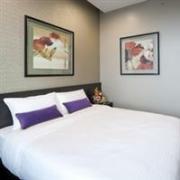 V Hotel Lavender can be contacted by calling (65) 6345 2233 or emailing contact@vhotel.sg.